The container ship is pulling into port. Time to unload the cargo. 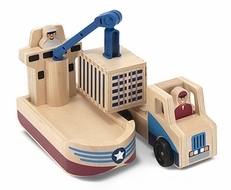 Children can help the captain and driver lift the cargo box swivel the crane and load the truck with this multi-vehicle play set. Each high-quality piece offers tremendous play value - from the container ship with its lift-and-swivel crane to the tough truck with smooth-rolling wheels to the easy-hitch container box that slides open and closed. 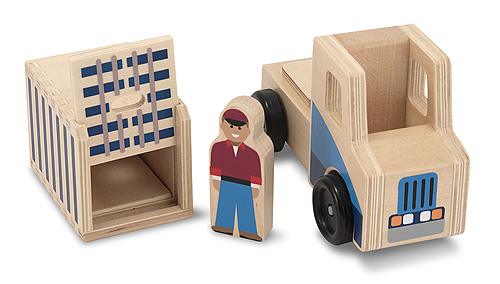 Pieces are sized to fit with all Whittle World play sets and accessories sets.